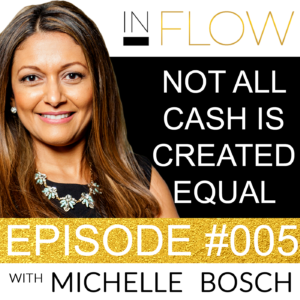 In this episode, Michelle Bosch discusses the three different kinds of money. You’ll get more insight into Michelle’s philosophy regarding money, and discover the mindset shift you need to make in order to live a life of financial freedom. 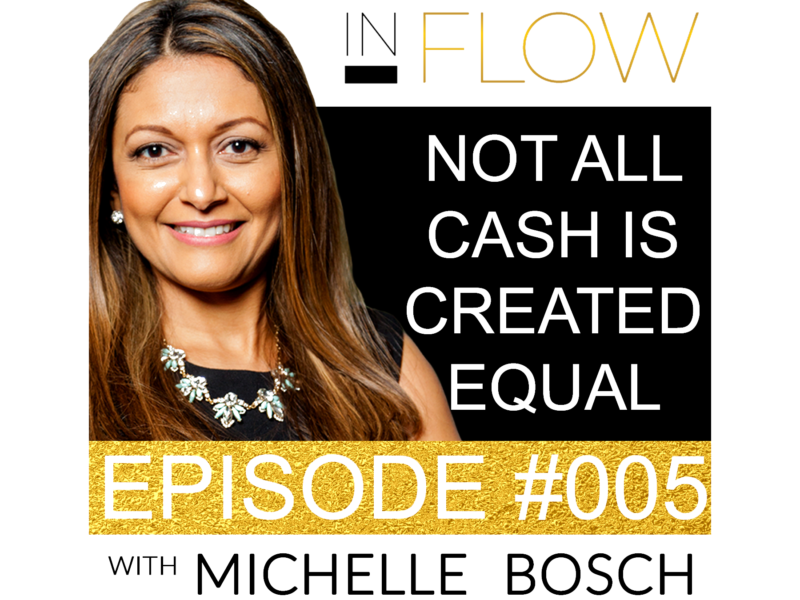 The 3 different types of money are generated in different ways, and Michelle talks about this using examples from her own entrepreneurial journey. As a bit of a bonus topic at the end of the episode, you’ll also learn more about active vs passive investment! If you want to live the Forever Cash Life you need to listen to this! Your chances of enjoying freedom of time, money, relationships and purpose are directly related to how well you understand what kinds of cash exist. The holy grail of all Cash is Forever Cash. This is the type of cash that will make you financially free forever. Today I would like us to start talking about Money but more from a financial perspective and talk about it in terms of CASH. In Episode 3 if you recall we talked about what is money in general and what it represents…and I discussed that in my experience it represents the best in you and when there is an exchange of money what you are really exchanging is the best of you for the best of me. When buying a property or you have a deal and you are either the buyer or the seller this type of exchange is exactly what is happening. When you own a business and are responsible for payroll and for a team or if you have a job…. this sacred exchange of the best of you for the best of the other party involved is also happening and you have high expectations for your team because you are expecting the best of them in exchange for the best of you. When you are being a passive investor or you are raising private funds from investors you are being the fiduciary of investor’s money…and here again you are exchanging the best of you …meaning your expertise, capabilities as an operator, experience and ability to create returns for their money regardless of market conditions is being exchanged for the best of them and they with reason expect a return for their money and that you will be a great steward of their money. When you are operating an asset such as a large apartment building you are also providing a home for people and as a landlord this sacred exchange is also happening. If you are in business and providing clients with a product or service you are also exchanging the best of you for the best of your client and you are delivering on value, customer experience, results etc. We are pretty much surrounded with this sacred exchange and energy is being put out there…some people might just not be aware of it but still operating from this premise….and some others are not aware of it and are not operating from this very fundamental intention and space…and so like in every industry we need to watch out. What I would like to talk about today though is about CASH like I said a little bit ago but from a financial perspective. Please if you don’t get anything from this show try to remember just this one phrase: ALL CASH IS NOT CREATED EQUAL. When you see several $100 dollar bills in your purse, they may seem like they are all the same because they are green, same size, same dude on the picture (which btw I can’t believe there isn’t a single bill with a woman’s face on it and that just goes to show you how wealth and women have traditionally not been on the same sentence together unless you inherited from your father or was associated to your husband…I don’t think a lot of men out there realize this so if you are a guy listening to this and have a spouse, a sister or a daughter make sure you have them tune it to this podcast)….at the same time WOW we are blessed to be amongst the first generations of truly wealthy women that have worked and invested their money wisely), anyway…and these bills they all buy you the same things. So it may appear as them being the same, however, how those $100 bills were generated, how often they come in and where they came from is a distinction that is pivotal for all of us to make and understand. In particular I want to expand on how cash is different based on how it is generated. Your chances of actually enjoying freedom of time, money, relationships and purpose are directly related to how well you understand what kinds of cash exist and what kind you want to pursue. So let’s start with ONE-TIME Cash. One time cash is what most people with jobs out there generate. You go to work for 8 hours and you get 8 hours worth of pay. If you are generating cash in this fashion you are in the slow lane to create wealth…UNLESS you are a neurosurgeon or an attorney that specializes in a difficult area of law or an entrepreneur or person for that matter who can demand thousands of dollars per hour for an hour of their time, effort and work. But even for these ultra high earners their income has a clear limit because the most you can technically charge is for 24 hours worth of work and here is the most important catch to all this ONE TIME cash business and that is that you deliver a product or service as a high earner BUT you get paid only ONCE. Meaning if you don’t show up the next day for this sacred exchange of value you DON’T get paid. So I do want to be clear though there are differences in the quality of the ONE TIME cash that you can generate. For example, in the real estate space you can flip or wholesale a house or a piece of land and you might make a $10,000 profit and you may have only worked 10 hours to make the deal happen but still you will only get paid once. If you stop working the money stops. If you want another $10,000 check, you will have to work another 10 hours and granted this is way better than exchanging $20 for an hour of babysitting work but you are still having to put in an additional 10 hours of work for another $10,000 in profit. The 2nd type of cash I want to expand on is TEMPORARY cash. Temporary cash is definitely an improvement on the One time cash world in that you work once but you get paid again and again but ONLY for a limited temporary time frame. For example, when you sell a piece of real estate and you offer to your buyer, seller-financing meaning you carry the loan instead of a bank extending them a loan (but you become the bank) and they pay you 20% down payment and then they pay you $500 every month for the next 10 years. This would be a great example of Temporary cash because once they pay off the loan or money they owe you…the monthly payments will stop. You will have probably work maybe 10 hours in putting the deal together and now you are going to get monthly payments for a decade and if you do enough of these…this cash flow could technically replace your check from your one-time cash world and you can put up your feet but only for a temporary period of time. Temporary Cash exists everywhere…you probably are part of it every month in many ways but just happen to be on the wrong side of the deal. I am pretty sure that a lot of you listening to this show have a mortgage, a car payment, online subscriptions etc where each and every month you are charged for a contract you have with a company and you are providing them with stable ongoing income for a period of time…so you want to be on right side of this equation and set up income streams where people pay you every month for a service or contractual agreement. So now let’s move on…. The HOLY GRAIL of all Cash is the 3rd type of Cash and that is Forever Cash. This is the type of cash that will make you financially free forever because you work for it once and you get paid again and again and again….forever. Forever cash is the type of cash that virtually all people who are wealthy and stay wealthy actually use. So continuing on with this example, In case you don’t know who Bob Parsons is…he is the founder of an Arizona based webhosting company called Godaddy and when he sold a good chunk of his company for $2.25Billion what is noteworthy for you to know is that he decided to put approx. around $1billion of that money into real estate assets such as apartment buildings and commercial property. So instead of spending his money he invested a large part of it into Forever Cash producing assets and no matter what happens to the rest of his money ….he will have cash flow coming in forever….and can maintain whatever lifestyle he chooses. So the moral of this story is that by funneling a portion of his income or proceeds from the sale of this company into Forever Cash assets he is set for life at a very high level and these assets will provide Forever Cash Flow for him no matter what he does in life. Other examples of assets other than real estate that produce Forever Cash Flow are dividend stocks…assuming of course they are from an established dividend paying company that has been around for a long time and is profitable and makes payments predictably…. Another examples are you owning some land and leasing a piece to a cell phone company or billboard company in exchange for the right to put up a cell phone tower or billboard…. One final one that I can think of right now is you owning intellectual property and licensing it out for a monthly fee it is product related or for ongoing royalty. Now the best part of all this that I have shared so far comes when you have built more Forever Cash Flow than what you currently need to live on and are financially secure and independent and even if you passed away (God forbid) your family would be receiving Forever Cash Flow from the assets you invested for a lifetime and generations to come assuming you still own the asset. And what is most exciting for me to share is that it doesn’t take long to get to this point of financial freedom and its actually pretty simple because the key to prosperity is simplicity. So to come back to my example of the $100 bills in your purse. The wealthy have always made this distinction between the three different types of cash. I say wealthy and not rich… because there is a difference on whether the bill came from your balance sheet or from your income statement. If it came from your personal balance sheet (which is nothing more than a fancy word for a piece of paper with a list of all the stuff you own on the left side and all the stuff you owe on the right side) then that dollar came from stuff you own or assets (much like Bob Parson does when he invests in apartment buildings and commercial property) and those assets are the ones producing those bills for you. If the bills came from your personal income statement (again this is just a fancy word for another piece of paper that shows you on top what monies come into your pocket and on the bottom what money goes out of your pocket and what you end up keeping) then that bill is generated by activities in which you engage personally every day. Meaning you are putting in effort, energy and time either at a job, selling a product or a service to other every day to get paid. So if you are a doctor, a lawyer, a dentist, a salesperson, a teacher, a coach, or any other job and your current profession is your passion and in exchange for that expertise and service to others you get a bunch of $100 bills…these bills are coming in once a month from your energy, effort and time…. And this is called once again One-time cash….because you are exchanging dollars for hours and there is nothing wrong this type of cash except that well it takes your effort, energy and time to get generated and it is taxed at the highest possible tax brackets. The last thing that I am feeling I really need to talk about before I wrap up today’s show is the difference between being an Active Investor vs. a Passive Investor. I made a statement earlier and that is that the key to Prosperity is simplicity. and now comes a decision do you want to go out there an learn the ins and outs of say assets such as real estate and start actively flipping property meaning you become an active investor or do you go out there and align yourself with a team of experts in the real estate space that offer opportunities to others such as yourself to invest in exchange for forever cash flow and appreciation potential? In this second case you would become a passive investor. Now a word of caution…please, please, please align with a team that aligns with your core values, has the expertise, the experience and has a proven track record on delivering results and returns, and has gone and made money in a down market as well as in an upmarket. Anyone one can make money on an upmarket…but people that have produced results and made money when everyone else lost it…those are the types of people that have Unique teams and processes in place that make them great operators of the assets your are investing in and will produce the returns they say they will produce…basically these people walk the talk and eat their own cooking. More specifically only invest your hard earned money with people that are transparent and consider their relationship with you transformational and are in it with you for the long haul vs. the ones who are transactional. Generating Money and Forever cash flow once you understand certain rules and principles is simple and no one should be losing sleep or working themselves to death to generate. Align yourself with people that you trust, that you know have proven results, that are metric-centric, that have assessed financial, macroeconomic and microeconomic risk and and where your intuition tells you that it’s a Hell Yes! So thank you for spending some golden time with me today and if you or anyone you know is interested in learning more about opportunities on how to become a passive investor and start creating Forever Cash Flow for you and your family please go to www.orbitinvestments.com to our Multi-Family section and submit your contact information. I’m hopeful you found the information I shared helpful. I look forward to spending time with you in the next episode. Talk to you soon! Previous Post: « Never In My Wildest Dreams….